Before electricity can travel into your home, it must pass through a substation first. A substation is an assemblage of equipment where electrical energy is passed in order to be stepped up or stepped down. Transformers inside a substation change the voltage levels between high transmission voltages and lower distribution voltages. The high transmission voltages are used to carry electricity longer distances, like across the country, whereas lower distribution voltages travel to industrial, commercial or residential consumers. In a T&D system, the major components typically consist of transmission lines, distribution lines, substations and switchyards. For this particular Blog, lets just identify the Main Substation Structures. Dead-end Structures are where the line ends or angles off. They are typically constructed with heavier steel in case they are needed to carry heavier tension. The two most common dead-end structures are H-Frame and A-Frame structures. Static Pole, is a single, free-standing pole that creates a shield to protect all of the equipment inside a substation from lightning. Static poles may or may not have overhead shield wires attached to enhance protection. It depends on the size of the substation as to how many static poles are needed. NOTE: Tapered tubular design is typically efficient and economical in dead-end andstatic pole situations when compared to AISC standard shape structures. Bus Supports are the most basic structure found inside a substation. Its main purpose is to provide support for rigid bus as it travels though the substation. Rigid bus is stiff and will not move around during weather events. Unlike rigid, flexible bus is typically used in high seismic areas in order to be able to move and dampen the seismic forces that occur. Examples of some equipment stands include:t can be of significant weight and must meet specific guidelines for structural loads, deflection limits or clearance requirements. Equipment Stands are the structures that the actual equipment sit on. When it comes to which type of steel is used, galvanized or weathering, inside a substation, I won’t say that you will never see weathering steel, but it is very rare. 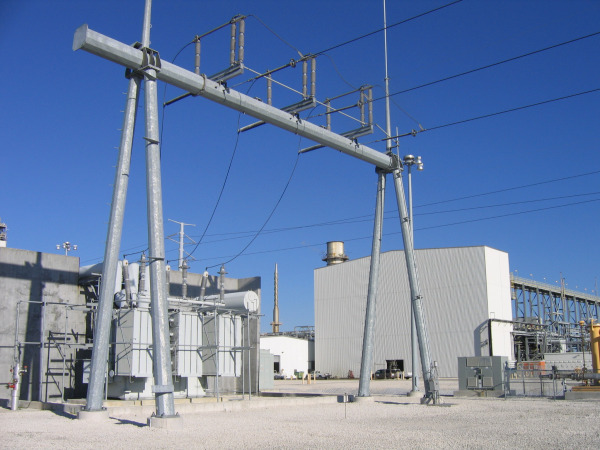 Weathering steel is used more in transmission structures than substation. One of the main reasons is because aesthetically, galvanized steel “looks” better inside a substation. Typically a substation is surrounded by a fence, has a metal building inside as well as white rock on the ground surrounding it. So the look of weathering steel, which is usually a dark brown color, aesthetically, goes better with a transmission line running through the woods to blend in versus in a substation. Let us know if this information was helpful. Comment below with and questions you may have, we would love to hear from you. How Do Electrical Transmission and Distribution Systems Work? Find Out. A Transmission and Distribution (T&D) System, has a notorious job of delivering electricity to consumers 24/7, 365 days a year. But before the electricity can travel into your home, it must pass through a substation first. A substation is an assemblage of equipment where electrical energy is passed in order to be stepped up or stepped down. Inside a substation is like its own unique “power world” where every pole, bolt, stand, surge arrestor or structure plays its own individual role. The second structure, a Static Pole, is a single, free-standing pole that creates a shield to protect all of the equipment inside a substation from lightning. Static poles may or may not have overhead shield wires attached to enhance protection. It depends on the size of the substation as to how many static poles are needed. NOTE: Tapered tubular design is typically efficient and economical in dead-end and static pole situations when compared to AISC standard shape structures. Electrical equipment can be of significant weight and must meet specific guidelines for structural loads, deflection limits or clearance requirements.Equipment Stands are the structures that the actual equipment sit on. So, although the concept seems quick and simple like flipping a light switch, much more is going on behind the scenes. Transmission lines act as the utility interstate system where electricity is transmitted at high voltages in order to reduce the energy lost in long-distance transmission. Although it’s hard to quantify structure types since there are always exceptions to the rules and never-ending configurations, transmission structures can be considered dead-end, strain or suspension. For strain structures, the conductors are directly attached through in-line insulators through or around the tower. In suspension transmission structures, the conductor phases pass through the structure, and are suspended from the insulator. Each structure type can either be classified as tangent, with no line angle, or angle, when there is a line angle. Steel transmission structures can be designed with tapered tubular poles, which are hollow, can be multi-sided and have a large base that tapers down, typically in the range of .18 to .45” per foot. And to dig a little deeper, all of these structures can either be guyed or unguyed. A guyed structure provides extra support by fastening a wire from the structure to the ground or another structure, whereas an unguyed structure is self-supporting. Want to learn the three types of transmission structures? Or what to consider before guying a structure? Download your copy of Transmission Structures and Their Configurations today.